The original purpose of a gazebo was to make a place from which one may ‘gaze' at a garden. Gazebos are used to make sitting areas with a sense of place. a good view, and a degree of shelter from sun and wind. 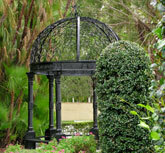 Gazebos can also be decorative features used to support climbing plants or to house garden statues. Gazebos can be successful on root gardens and terraces, which often need seclusion, privacy and enclosure - to counter the superabundance of sky. So the term gazebo is used today for any open structure, supported by columns and covered with a roof. A large gazebos is equivalent to a small summerhouse or pavilion with a view. A gazebo can also be a belvedere on the roof of a house. 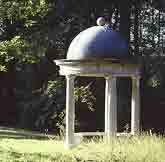 Palladian temples provide a model for traditional gazebos in stone or wrought iron. The symmetrical columns and domed root draw from the design of the Palladian Temple. where the exquisite geometry was set against the wildness of untamed nature. A rose gazebo is a graceful structure made of steel wire and rods, making very good use of the metal’s natural properties. The graceful lines of the canopy flow into the lines of the supports. The idea of making gazebos draws on the one hand from temples and on the other from outlook towers (also known : miradors, belvederes and summer houses). Many gazebos are now used primarily as garden ornaments.